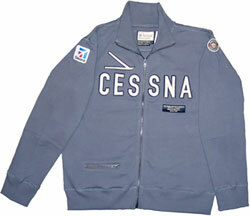 Mens vintage cotton blend, with felt Cessna logo patches on antique blue full zippered jacket. Red Canoe - National Heritage Brands has just launched their long awaited "USAviation Heritage" collection of licensed products. The line consists of high quality clothing, headwear and accessories featuring the vintage logos of some of America's biggest aviation icons. 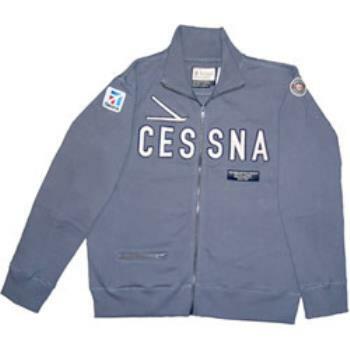 CESSNA Aircraft, American Airlines, BOEING Stearman, USAF and Bell Helicopters are all celebrated through their historic logos. Renowned for its quality and design (Harrison Ford is a regular customer), the Red Canoe - National Heritage Brands line started with Canadian Aviation Icons; Noorduyn Norseman, deHavilland Aircraft of Canada, Royal Canadian Air Force and Avro Aircraft among others. Pilot Shops, Aviation Museums, Major Airport Retailers and Aircraft Dealers have had tremendous success with the concept. Vintage wool felt logo patches on antique blue full zip jackets and khaki canvas pilot and weekend travel bags make for ideal pilot gifts. Caps feature the vintage logos in felt appliqué and the North American Made T-shirts are pre washed and made in small runs, custom colors and fit.